A few weeks ago, I posted a map showing how Auckland’s city centre-based cycle network is full of gaps. We’ve got some nice bits of infrastructure, such as the Grafton Gully and Beach Road cycleways, and a few on-street cycle lanes, but it all stops and starts without warning. The post attracted so much interest that I thought it would be good to make a similar map for the entire city. 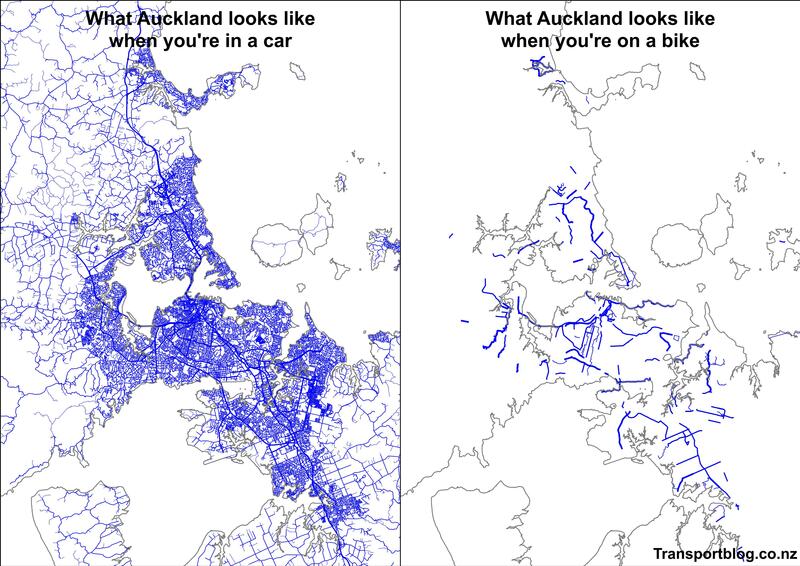 So here it is: Auckland by car versus Auckland by bike. The map on the left shows the region’s road network, which includes motorways, arterial roads, a dense street network within the built-up areas, and little tendrils of roads stretching out into the countryside. Auckland’s current cycle network, on the right, consists of a bunch of random lines that don’t really connect. It looks like a plate of spaghetti that’s just been strewn all over the kitchen floor. Relatively few of these streets have truly safe infrastructure, either – it’s mostly green paint next to traffic. If you want to cycle in Auckland, you’ve got to spend a lot of time on roads battling it out with large steel boxes and risking being doored. It’s no wonder that only 1% of commuters are cycling to work in Auckland if less than 1% of our roads have safe cycle infrastructure. However, I’m optimistic that we can fix this problem and deliver better transport choices to Aucklanders. I was down in Christchurch a few weeks ago for a conference, and while roads are still a bit chaotic from the earthquakes, they’re pushing on with a bunch of new cycle facilities and a re-think of their street design manual. It can be done in New Zealand! From 2006 to 2013, the number of people commuting by bike in Auckland increased by 26%. Overall, 6% of new commute trips over this time were made by bike – even in the absence of a concerted effort to provide safe facilities. New Zealand researchers find that a larger, more ambitious programme of cycle upgrades will deliver a higher benefit-cost ratio than a smaller programme. In other words, if we make every street safe to cycle on, more people will choose to get on their bikes. Research from Christchurch, which we highlighted in a Sunday reading post, also shows similar results from Christchurch’s major cycleway network. Importantly, 28% of the network’s benefits accrue to drivers as a result of reduced traffic volumes. Data on demand for previous infrastructure networks suggest that there can be an “S-curve” of uptake as networks get built and completed. This means that there’s likely to be a period of steady if not spectacular growth in demand as new projects come online. But at a certain point, the gaps between safe cycle infrastructure will be filled in, enabling rapid growth in demand as cycling becomes safe and useful for many more trips. What do you think of Auckland’s cycle network? How could it be better? Lastly, if anyone wants to send me appropriately formatted (.shp or .kml) maps of current cycle networks, I’m happy to make a similar map of your city. Local routes feeding schools and centres are equally valuable, but these more often involve quieter roads. Build the motorway + arterial alternatives and you have a connected network by default, expand from there. Local focus us what has given us the disconnected spaghetti model. And the right-hand map is *generous* as it includes bus lanes such as Remuera Road as cycle facilities – despite only a small part of the country ever being willing to ride those. Lot to do still. It is a great visualisation making a good point, but not exactly a fair comparison. It implies that cyclists cant use the existing roads or footpaths. Yes its not safe, but it exists and many use it. If they changed the law overnight and made car drivers responsible for any accident involving pedestrians or cyclists like they do overseas, then that would make a huge difference. It should happen, but I just don’t see that happening. I think the problem that Auckland will have is the major conflicting demands between pedestrians, cyclists, cars, buses and trucks. We need more buses and more bus lanes to meet PT demand. Many of our arterial roads simply cannot fit proper wide footpaths, a bus lane in each direction, a single vehicle lane in each direction, a flush median (necessary with so many property accesses) and a physically separated cycle lane in each direction. It just doesn’t fit. Can you guess which component is the first to get thrown out in the design stage? Yes, the cycle lanes. We get the bus lanes because we need them, and cyclists can just use the bus lane right? LOL! Even if we had a billion dollars to throw at the problem we simply cannot fit that cross section into most of our existing arterials unless we want to bash down lots of houses and heritage buildings and cut down trees. It just isn’t going to happen. Even if we did manage to have unlimited funds and bashed all the houses down and cut the trees down and widened the road, what happens at the intersections? Most are huge with all the turning lanes and what not and then to add in extra bus lanes and extra protected cycle lanes, you will need more land with usually more expensive/heritage buildings at the corner. You would end up with an even larger intersection. The cost would be crazy. The cycle lanes are the first to go in any design because of limited space(which means money), so that is why we will never have more than a hodge podge network of safe cycle ways. It also seems like AT spreads their cycling money all over the city which I think is a stupid waste of money because you do end up with what we have now. They should focus all their investment into one area, probably the CBD or the city fringe and spread out from there. Make moving people, not cars, the priority. Most people use cars to get to work in auckland and PT is pretty useless for most people to use in Auckland and there are more people that own cars than bicycles so it still is about moving people. If you have a 4 lane arterial and 2 are bus lanes and 2 are vehicle lanes, you cant really depriortise cars more than that unless you ban them from the roads or start tolling everything which would never happen. You’ll get a lot more mad people than the death-threat tree-huggers in Titirangi. You’d get angry drivers going on about human rights violations or something. So the answer is that its going to be a very long and arduous path to safe cycling becoming mainstream in Auckland. That’s a problem on the way to, not a reason not to be, reducing our excessive car priority. No, the cycle lanes are the first to go because transport agencies place too low a priority on them relative to other uses of the street. (Such as parking.) If money or space was the issue we’d never see AT proposing to widen intersections for cars. Not really Peter. Many arterials have clearways that are either bus lanes or vehicle lanes in the peak and parking in the off peak. You still don’t have the space even if you had 24/7 bus lanes and no parking. The road isn’t wide enough to have a bus lane AND a segregated cycle lane AND a single vehicle lane. Intersections are bottlenecks in the network. Widening an intersection to improve throughput is far cheaper to adding efficiency than widening several kms of road. So if the business case stacks up, then the intersection gets widened. But it doesn’t happen often in established areas because the surrounding land is too expensive. Widening intersections is the single most efficient way to destroy place quality. What about the place your flow is dismembering? Flow religion is the number one crime of traffic engineering. The City is best understood as an interwoven ‘space of flows and space of places’ [Manuel Castells 2004], it is a mistake to look at a city and only see one part. Ari – A lot of cycle lanes are being built with current motorway projects ATM! Waterview, northwestern has them, grafton gully has one, MHX provided cycling infrastructure etc. Obviously they are separated from the motorway, but the point is NZTA has been more proactive about cycling than AT, they are using motorway corridor land to build these. Buslanes don’t need to be installed on every Arterial route, as many would be doubling up on existing routes, so alternating between bus and cycleway seems achievable. But the point is the lack of investment in one of the greatest value for money transport modes. The wider benefits are huge, but can’t really be fully accessed without a proper network of separated ‘safe’ cycleways. Interesting theory but the ‘it’s because of buses’ doesn’t stack up in reality. Look at all the main routes leading to the CBD, including the bus routes. If I’m not mistaken none of these* have bus lanes at all, but they do all have four to six lanes of traffic and/or parking. *Exceptions are great north which has bus lanes and traffic lanes and parking too (!) and Richmond Rd which has only two traffic lanes and two parking lanes, but the traffic lanes are about 5m wide. Patrick, we were talking about moving people, not about making places where people actually want to be. 😀 Totally different, but related things. My point still stands that intersections are bottlenecks rather than the connections between them and that money is best spent on the bottle necks to maximise efficiency. IAL, it isn’t a theory, it is a fact why we get bus lanes but never segregated cycle lanes. All those roads you listed, if they can’t justify bus routes, it would be much harder to justify segregated cycle lanes. If you can justify bus lanes at some stage in the future then you can be sure segregated cycleways wont be going in. Beach Rd and Nelson St have no key bus routes so that’s why we are getting segregated cycleways there. It is also why you wont be seeing segregated cycleways on Dominion Rd, Sandringham Rd, Mt Eden Rd, Manukau Rd, GNR, GSR etc. It is always bus vs cyclists and bus always wins. Taking parking away for a bus lane during the peaks is acceptable to most people, but taking out parking permanently and lots of loud people come out of the woodwork and democracy triumphs, for good or bad. And are you seriously suggesting that cycle ways should be built on the motorway!? When I lived in South Auckland, I found the cycle lanes in Manakau to be Suicide lanes. I am pleased to be back in Hamilton where there is much better cycling opportunities. Brendan, in your opinion what are they getting right in Hamilton that we are getting wrong in Auckland? I don’t think we can accept a situation that (as Ari so depressingly puts it) its going to be a very long and arduous path to safe cycling. If our roads aren’t safe then we’ve failed on their most basic and important requirement. Too many people are being placed in seriously dangerous situations due to vehicle and bus traffic not being properly managed. Hamilton has more slow-speed zones? Maybe that’s part of it? Less traffic, vehicles on the road probably also helps. Could I ask a favour and get the map done in layers? Good plan. Real cycleways are very few and far between. Riding in bus lanes is great; until there’s a bus, let alone six buses, and we all know Auckland is getting more and more buses. But anyway most bus lanes are temporary and intermittent, so even if you’re not playing leapfrog with a diesel belching giant they aren’t actually not there most of the time. Yeah sorry I’ve been a bit slack on it lately what with uni and all. Will try to get the North Shore bike infra finished soon. I think what we have in the map above is pretty much my map with only the top “cycle infra” layer turned on. Auckland must be a funny place – only city in the world where cycles don’t seem to work on roads. Missing from the map are many roads AT and CAA list as safe for cyclists. https://at.govt.nz/media/imported/5149/cycle-map-central-auckland.pdf Route on quieter roads recommended by cyclists marked in yellow! [Admin edit: After a reader inquiry, we investigated the IP address on this post and found that it belonged to serial troll Phil Moore. He appears to be attempting to impersonate cycle advocate and local board member Pippa Coom. The benchmark for me is: can my mum or a12 year old girl cycle between two points safely? I’m not going let either cycle in the bus lane on Symonds street. Or even on Queen Street. I’ve been hit on Lorne Street. The answer isn’t cycle lanes everywhere, but they are needed in a lot of places and road design needs to be updated. A quiet street is fine until someone barrels down it at 60kph without leaving enough space. There needs to be a systematic approach, not only for cyclists, but pedestrians and communities. This means ‘dead-ending’ some roads for cars while allowing walking and cycling between, it means banning cars in some places and it means shared spaces. That map is dishonest if the safety of and range of abilities of people we want to have cycling are considered. The AT map is great, if you’re a brave, experienced cyclist. For the other 98% of interested cyclists, it’s a load of cobblers. Anyway it’s good to see that map on the right is at least not completely blank anymore. I have to agree with Pippa; as I said in the original post a few weeks back, the above map is missing a lot of cycle-friendly infrastructure. There are hundreds of km of quiet (and often calmed) local streets around Auckland, as well as considerable off-road pathway connections through reserves, and other links like the CBD shared spaces. E.g. the above map shows the cycle-laned roads around Pt England but not the treated local streets inside them or the adjacent links through Maybury Reserve. (2) there still tends to be an effect of creating unlinked “islands” of cycle-friendly routes, separated when they have to CROSS a busy road. There’s a nice map of London that illustrates the same problem (https://departmentfortransport.wordpress.com/2013/03/23/bike-paths-along-main-roads-are-key/) and I made the same kind of map for Chch about 12 years ago (http://can.org.nz/resources/why-a-cycling-strategy-on-its-own-will-not-increase-cycling). (3) there will still be a need for accessing some destinations by bike on busy (non-motorway) roads, therefore provision of suitable cycling links ALONG them also needs to be done. That really needs to be separated cycleways if you are going to attract the masses. Pippa and Glen both make good points. I’d thought about how to deal with the “quiet residential streets” issue when putting together the map. Pretty quickly realised that I didn’t have the data to figure out what was a safe residential street and what wasn’t. I always think back to Berkeley, CA, which is a university town laid out on a rectangular street grid. What they’ve done is install bollards and other impediments to traffic on many of the non-arterial roads to discourage rat-running while still letting cyclists through. It seems to work pretty well. Yes, neighbourhood greenways or bike boulevards have a lot of potential for cycling (I wrote about their application to NZ here: http://ir.canterbury.ac.nz/handle/10092/6832) but it’s certainly easier to implement them in a grid-like network (e.g. much of Christchurch). Hamilton & Christchurch are flatter cities. Auckland is not and the weather is more changeable ….two barriers to cycling uptake…I wouldn’t want to cycle to work even with cycle lanes if I was an office worker that had to where a suit or similar without shower facilities at the place of work….all sweaty yuck. I guess other types of work it doesn’t matter. There is validity to this, but a) work isn’t the reason only to move around (shopping, socialising, going to the beach) and b) not everywhere is hilly. The biggest challenges are the shore, East Auckland and the far west. I personally agree that cycling resources here are wasted. There are places with worse weather that have much, much higher cycling uptake. Yes fair enough, still quite useable and electric bikes would help solve the issue for others? I think it’s going to help a lot – if it’s common then yeah, the whole city is opened up! We just need a mass produced front wheel drive solution that can fit any bike (back wheel is better, but overly complicated I think) – I don’t think we’re at everyday consumer level yet – a copenhagen wheel\flykly for front wheels. The issue with the “Auckland is hilly” claim is that some of our lowest cycling levels are in comparatively flat areas like Manukau (areas between Manukau City Centre and Mangere Bridge), while some of our highest are in the Central Isthmus, which is comparatively hilly. Hills are hills, and we may never get Copenhagen levels of 40% cycling in hilly-er Auckland, even under otherwise identical conditions – but infrastructure trumps all. The cycling mode share data is from http://www.censusauckland.co.nz/ – hillyness is more subjective, but the differences in topography and cycle uptake are serious enough that even without mathematic data on that, I can state the above pretty confidently. Wellington and Dunedin are both as hilly as (if not hillier than) Auckland and both have about 3.5% of commuters cycling to work. Wellington and Dunedin are both much hillier than Auckland. Yes what a pity we don’t have beautiful year round climates like the Netherlands, Germany and Scandinavia. I am pretty sure that lots of people in Northern Europe cycle in suits and other work wear. In fact I know because I have seen heaps of them. They just don’t try and cycle at 40km/h like Auckland lycra cyclists do. Remember it isn’t a sport, it is just a way to get from A to B – at the speed that suits. You say that Hamilton and Chch are great for cycling because no hills. Yet the cycling rates there and other flat cities like Palmerston North are not much higher than Auckland. While hilly Nelson has a much higher cycle mode share. Why? The three I’s. Infrastructure, infrastructure, infrastructure. As Max says above, we may not get the 40% of Amsterdam or 60% of Groningen but we can easily achieve the 10-15% of hilly Swiss and Italian cities. Then it is a madness we NZers could do with more of! Doesn’t seem to stop people from international cities such as SF etc. Build the infrastructure people will use it, especially with popularity of health and fitness taking over the city, cycling is only going to flourish with safety. Auckland’s cycling network is slowly improving and since moving to Auckland in 2007 driver behavior also seems to be getting better. However, like roads and PT we seem to be fixated on big expensive projects while ignoring quick and cheap tweaks. For example, I am happy cycling in bus lanes, but these are rarely continuous, often broken by car parking and normally only operate 2 hours a day. The Grafton Gully cycleway is great, but think how much new bus lane could be painted for $11 million dollars, benefiting PT users, motorists and cyclists. With the Waterview connection and Auckland motorway network nearing completion, there is a huge opportunity to apply these tweaks to the nearby local roads that should see reduced traffic volumes. In particular in my area, Manukau Road, The Drive, Gilles Ave and Mt Eden Road are crying out for better bus and or cycling infrastructure. With less traffic there is no excuse not to provide this and the planning needs to start now. Except that money was never available for anything else, NZTA would have built the Grafton Gully cycleway or instead spent it on a motorway somewhere instead. Personally, I would have preferred to have seen it spent on cycle lanes on roads in the city, but that’s more because that’s where I ride, and where I feel the least safe, than because I don’t like having it as an option. But based on AT’s attitude I’m guessing it’s as good as it’ll get for a long long time at the moment, so I can’t see myself using my bike like I did when I like in Europe, most days it just sits on storage. And that’s the problem in Auckland, huge latent demand, but absolutely no money or political leadership for anything to be built and any change to happen. Parking alway trumps. Yes the car map certainly looks incomplete. Perhaps one or maybe two my links across the harbour and one to Whangaparaoa would do it. They’re all tunnels so won’t show on a surface map like this anyway. The best response I have ever had! Whangaparoa is cut off? When did that happen? I managed to sneak through last weekend. I dont know about the place you mentioned but WhangaparAoa is poorly connected. Not at all. It is a peninsula. With a road into it. Like many other peninsulas. People weren’t forced to live there. They made choices. Surely a bridge from Devonport to Parnell, and then Bucklands Beach to St Heliers will unblock more people who were forced to live on peninsulas than a gulf harbour to long bay bridge! Also need a bridge to Waiheke Is, It’s unfair the only mode of transport across is by some sort of boat. No nevermind PoAL is busy filling in the annoying wet bit so suburbanites like mfwic can drive everywhere directly and not be troubled by harbour. Josh you’ll need at least two bridges to Waiheke, otherwise you’ve reproduced a peninsular like Whangaparaoa where the poor people only have the option of driving or ferrying or bussing or cycling. Patrick I dont just expect roads. I want to see some nice expensive rail lines built across as well. It would be great to get some of everyone else’s rates spent on my area. Hell it would be nice just to get our own rates spent here like we used to under NSCC. Yup I can imagine things will slowly come together, linking each major project together etc. Drivers will come more aware of cyclist the more there are of them. I quite like the idea of cycles working with trains better, but is there enough room on them for several bikes? Peak times just the issue I guess. Could have bike only carriages or something. I see AT were experimenting with bike storage facilities etc. You don’t have to take the bike on the train to make it viable. It is more important that people can get from their house to the train station. All the major employment centres except East Tamaki are near train stations so once people arrive they shouldn’t really need their bike. The big challenge is getting the infrastructure to the train/busway/ferry station that makes people feel safe and adequate cycle parking. Of course we have all the models we need for that in Northern Europe so no need to reinvent the wheel. The changes to driving in the UK are remarkable. In both York and more so in Cambridge there seems to be many more cyclists than ten years ago. The traffic seems calmer and the cyclists are moving very freely. All the main thoroughfares seem to have pretty good cycle lanes with only a few shared footpaths, all this on a narrower road reserve than we have in NZ and with some massive bendy buses. Talking to some of the locals it seems the political will is the most important factor. Some councils seem to be doing better than others. In Washington DC I was also surprised by the number of bikes and the flash bike barn/cycle repair/cycle lease facility at the Penn station. Bikes seemed to be in evidence when out in the suburbs as well with bike racks on buses but not as many bike buses as in New Orleans. Although out in the suburbs of New Orleans, at least the ones I went too, pedestrians and cyclists seemed to have died out. It was hard to get out of some neighbour hoods which seemed to have 6 lane roads around them no crossings or pedestrian phase at the lights.